BRITAIN’S top women pilots are planning to soar to success after being selected to represent Team GB in the Women’s World Gliding Championships (WWGC) in Australia next year. Ayala Truelove, Melissa Andersson, Liz Sparrow and Claudia Hill are now honing their flying skills ahead of the competition. Liz Sparrow, 57, from Romsey in Hampshire has been the highest ranked woman in world gliding and is the most experienced member of the team having competed in seven international championships. Liz said: “It’s great to be a part of the team and a real privilege to be representing my country. Claudia Hill, 46, from Didcot, Oxfordshire, is currently the UK’s highest ranked female glider pilot and has achieved a top ten finish in the last two consecutive World Championships. Ayala Truelove, 53, from Tadley in Hampshire, first tasted international competition in 2009 during the Women’s World Gliding Championships in Szeged – finishing an impressive fourth in her first outing. Melissa Andersson, 44, a member of London Gliding Club, has captained the women’s gliding team at competitions in Sweden, France and the Czech Republic. All four pilots were chosen by a selection committee using criteria based on UK competition results and success in coaching programmes held throughout the year. The international competition to find a women’s world gliding champion will be held over 14 days and includes a practice week for the pilots to familiarise themselves with the local gliding conditions and terrain. 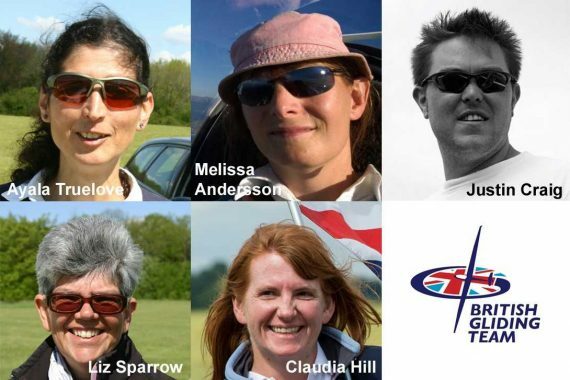 The newly-formed British Team will compete in the 10th FAI Women’s World Gliding Championship in Australia at the Lake Keepit Soaring Club from 4th January 2020 to 17th January 2020. The 11th FAI Women’s World Gliding Championship will be held at The Gliding Centre in Husbands Bosworth, Leicestershire, in 2021. Be among the first to hear the latest news from the British Gliding Association.